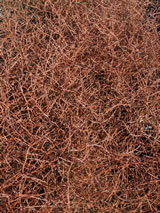 Picturesque ground cover which forms a cushiony mound of intertwining rusty-red branchlets. Long narrow leaves are mustard-green. Tiny flowers will form iridescent blue berries if fertilised. Grows well in poor, dry, sandy soils. Great for coastal and exposed sites. Very hardy.